Great Divide Trail Riders have rides on the last Sunday of each month. We hold a wide range of rides including; Forest, Pubs, Beach, Wineries and Mountains with the ever popluar camp overs. We are a social club with an emphasis on making new people feel welcome. Est. in 2003. Please read on for further History. Pyalong Ride & General Meeting @ the Famous "BULLBAR"
At the end of 2002 a small group of mates decided to come together to form a new club. In early 2003, and driven by a strong desire to form a harmonious group for mates to ride our horses together in & around our local area, discussions were held in regards to forming a new ATHRA incorporated riding club. It was decided that our club rides would be held on the last Sunday of each month and with some relevance to location and a bit of play on words the name “Great Divide Trail Riders” was chosen. With much support, guidance & assistance from ATHRA Vic, other clubs, friends & associates, our first “official” ride was finally held at Strath Creek on 29th June 2003. Since our start in 2003 with 32 members our club membership has now grown to around 100. A second, shorter ride around the 2nd Sunday of each month has been added to the ride calendar, at the request of members who couldn’t always attend, or manage the full day rides but didn’t want to miss out on the camaraderiewe all enjoy. Initially one ride was held at the end of the month with usually a maximum of 15-20 riders attending. These days our members come from near and far, not just “local” we may say and due to this the rides are much varied in terrain and location, which is a great way to see Victoria. Numbers range for rides now from 25-35. Since its beginning the club has had a feeling of helping out your mates. This is always shown with any event GDTR put their minds to do, however big or small. No ride is left up to any one individual, it is always a group effort. Many putting up their hands to help. I suppose this is why in such a short space of time, this little club has grown to what it is today. News has spread of what it is like to be a member of the Great Divide Trail Rider’s, what a great compliment to all. Many guests that come along to our rides want to join up. A recent couple who attended one of our rides sent a thank you message which I think sums the club up….. Thanks for having us along on the Mt Macedon ride today, Gary and I both enjoyed the day. The club is awesome and so friendly, so many people chatted with us, it was just great, we were very pleased with our horses as they behaved pretty well, as we haven't ridden out with such a large group before..
We have been riding together for years, it’s so nice to ride in a group and feel so welcome..
GDTR membership consists of a mixed group of individuals from kids to people that have ridden all of their life. This brings excellent knowledge and a diverse group of people together. Many of the spouses and non riding kids help out with back up on any ongoing camp ride or with assistance in setting up sites etc. So as you can tell it is real family affair, who all share a passion for horses and riding on the magnificent tracks & trails available to us. Our rides in the last couple of years are held in other various locations throughout Victoria due to the fact that our member base is ever expanding. Rides can be from Forest, Pubs, Beach, Wineries and Mountains with the ever popluar camp overs. Pub rides as you can imagine are very well attended, as have been our newly included Winery rides. I’m not sure if this shows that most of us enjoy the odd drop or two! Our committee is a very hardworking and enthusiastic group of people. We have a newsletter that comes out every month detailing past rides, upcoming rides, general information, photos etc. These can be seen on the ATHTRA Web site. 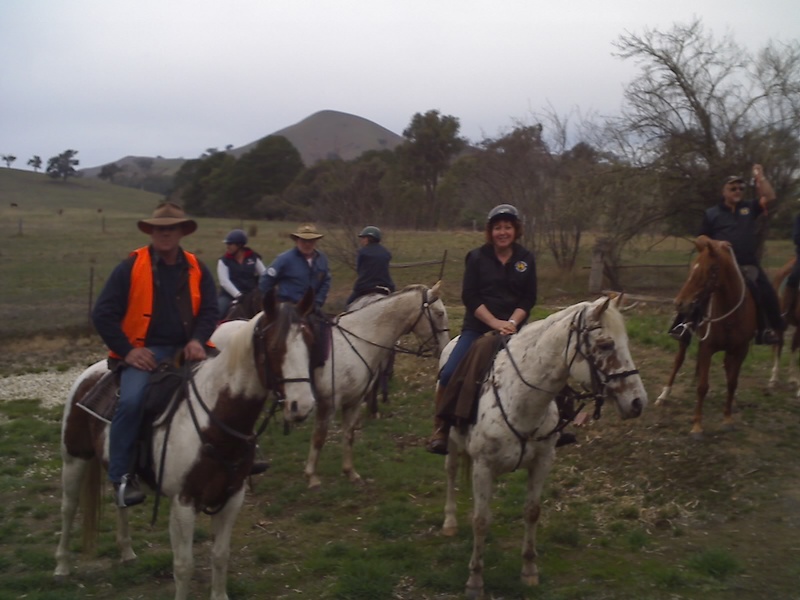 Accreditation has brought a different aspect to trail riding in recent years. Amongst our small group we have a large contingent of accredited members. This is testament to the dedication of our members. For a relatively young club, we have achieved a great deal. This being demonstrated by the appointment of two of our members now holding positions on the ATHRA Victoria committee this year, which is a great achievement. If you are ever down this way please feel free to come along and join us for a great day of riding in a happy friendly atmosphere. Guests are always welcome!! Happy Trails – Great Divide Trail Riders.